I've never heard of this boat and know nothing else about it. It makes perfect sense, however, in a land where good lumber is almost nonexistent but palm trees thrive. 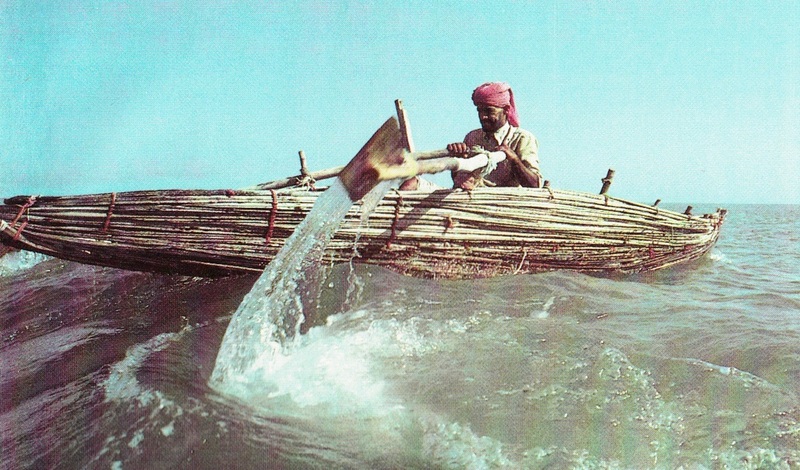 Most bundle boats are propelled by paddle, but this one uses oars. 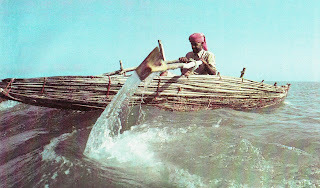 Generally, bundle boats lack the strength to mount an oar pivot, but it seems not to be a problem here. Each oar rests against a single fixed thole, and is held in place with a lashing. Note how the oar blades are fixed to the shafts at an angle to reduce torque -- a sophisticated touch on a primitive boat type. The boom Sohar under main and mizzen. She also flew a jib. (Click any photo to enlarge.) All photos are from The Sinbad Voyage except where noted. Sohar careened to reapply antifouling. This shot gives a good sense of her underwater shape, and the plank stitches can be plainly seen. Each strake was 8-12 inches broad, and between 2 1/4 and 3 inches thick depending on its position. No stealers were used. 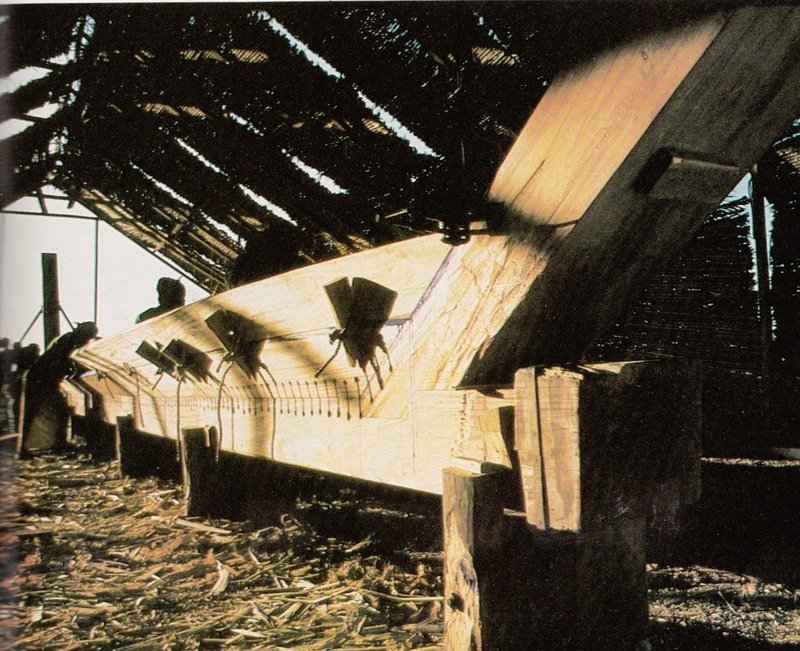 The strakes were normally divided into four or five sections, between 5 and 15 feet long, butted end to end with tongue and groove joints. The edge-to-edge surfaces between the strakes were flat; that is, there was no step or groove, though every 18 inches or so a locator dowel was used. The entire form was held together with coir stitching, done with four-strand cord. Stitch holes were approximately 4 inches apart, and placed 2 inches from the edges of the strakes. As is typical in traditional forms of shell-first construction, the planks were cut to the needed shape without patterns or spiling: the builders simply know what shape to cut and how it will lie when bent and twisted into position. Planks were gotten out and fined up with soft iron chisels. Getting the mating surfaces to lie flush against one another to the required accuracy of 1/64" inch necessitated several trial fittings for every plank. Severin does not say whether the thick planks were steamed or fire-bent, but it was evidently hard and time-consuming work getting them into place. Lashing the first garboard plank to the keel. 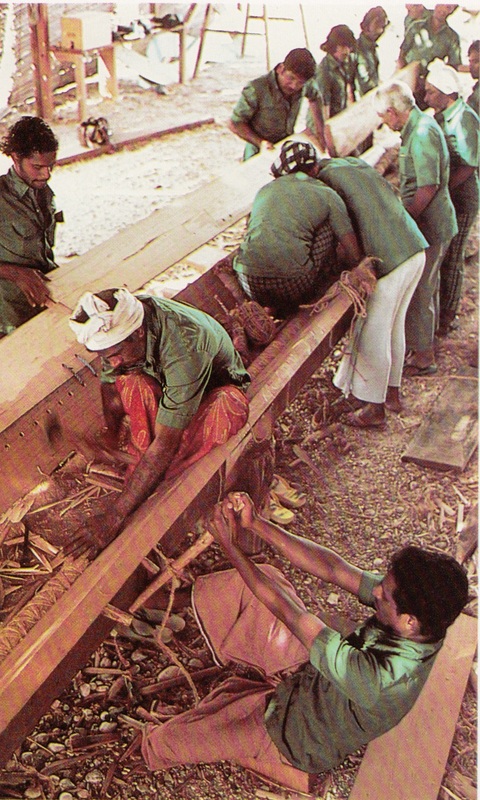 The worker at the bottom is using a short pole as a lever to tighten the lashing. The "python" can be seen at the left, just inboard of the plank. When Kasmikoya, the senior ropeworker, was ready, he divided his men into pairs, an inside man and an outside man. Each pair worked at passing a strand of the finest-quality coir cord out through a hole in the plank, back through the opposite hole in the keel, round the python and out again. There the outside man took a turn of the cord around his lever of stout wood, put his feet against the hull, leaned back, and hauled the string as tight as he could. On the inside, his partner tapped on the string to help it tighten.... Three times, stitch and overstitch, they lashed together plank, keel and python until finally the last stitches were plugged with little tufts of raw coconut fiber. The complete garboard, installed; the next plank clamped in place and ready for stitching to begin. 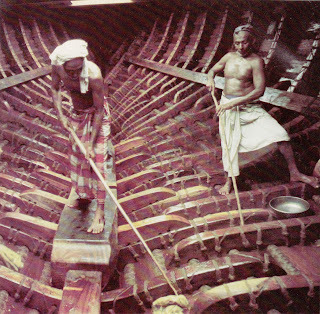 After five strakes were in place, floors were installed, again lashed in place through holes bored in the planking. Partial frames were added in sections as the planking progressed. (Stitched hulls must be built shell-first; pre-set frames would make it impossible to stitch planks together.) Floors, lower frames and upper frames were all free-floating: that is, although they overlapped in height, they were not connected to each other. 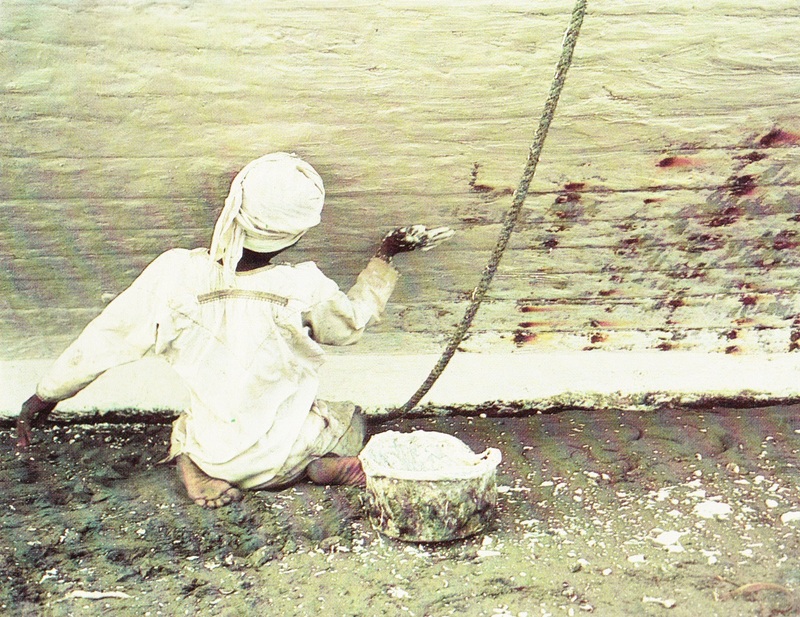 The framing was neatly gotten out on Sohar, unlike the frames on working dhows which were often hewed flat only on the bottom, and left entirely raw on their exposed surfaces. Floors and frames were also neatly notched so that lashings lay flush with, or recessed below, the surface, protecting them from abrasion. The exterior, below the waterline, was coated with antifouling made from lime mixed with mutton fat. Even in the teredo-infested Indian Ocean, this was entirely effective. 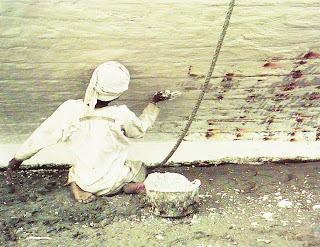 Applying lime-and-fat antifouling by hand. 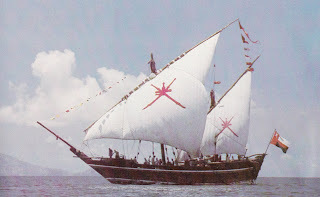 (The vessel shown is not Sohar.) One can only imagine what this does to your skin. All interior surfaces were saturated with vegetable oil, a process that prevents the lashings and pythons from rotting if repeated every four to six months. But the veggy-oil coating had a serious downside: it generated copious amounts of hydrogen sulfide, so noxious that it caused sore throats, made eyes sting, and corroded electronics and other metals. So bad was the "bilge gas" that the crew avoided spending time belowdecks except in the worst weather. Oiling the interior. Note how the lashings are neatly set into the frames, and how the frames are also notched over the pythons, which run lengthwise over the plank seams. The floors and partial frames are not fastened to one another -- indeed, they do not even touch. 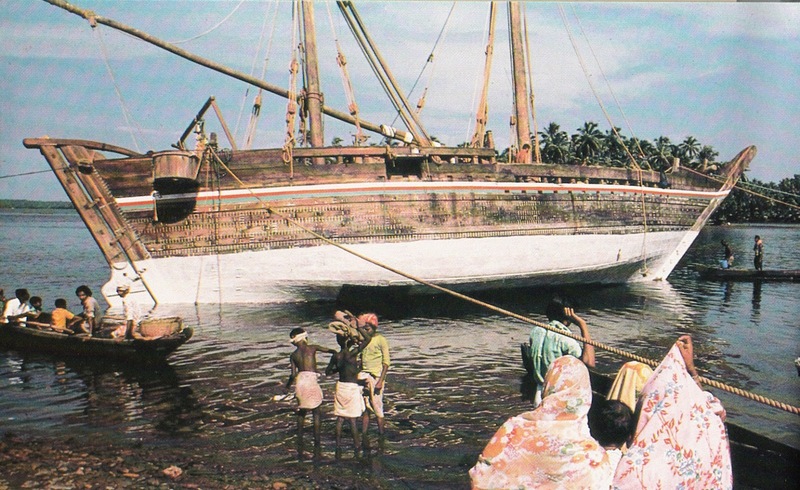 Archaic though it may be, the stitched planking method employed on Sohar was entirely effective. The ship leaked no worse than many another wooden ship, and it successfully completed its 6,000-mile voyage without serious mishap, and in good condition. How Accurate Was Tim Severin's ARGO? The Argo in Istanbul. All images in this post are from The Jason Voyage by Tim Severin. Click any image to enlarge. In The Jason Voyage: The Quest for the Golden Fleece , Tim Severin describes his recreation of the legendary Greek's quest. As in his other books detailing his reenactments of other legendary voyages, Severin's main objective is tell a rousing tale. While his reenactments all seek to demonstrate that the original voyage described in the legend was feasible -- and thereby lend credence to the legend -- Severin doesn't overdo the argument. He retains his credibility by never pretending to be doing serious science, the way that Thor Heyerdahl did. Instead, Severin combined an adventurer's urge with a fascination for voyaging legends and a skill at writing exciting first-person narratives into a tremendous career which I can only envy. To the extent that a date can be ascribed to any truth that lies behind the legend of quest for the Golden Fleece, 1300 BC is the best guess. 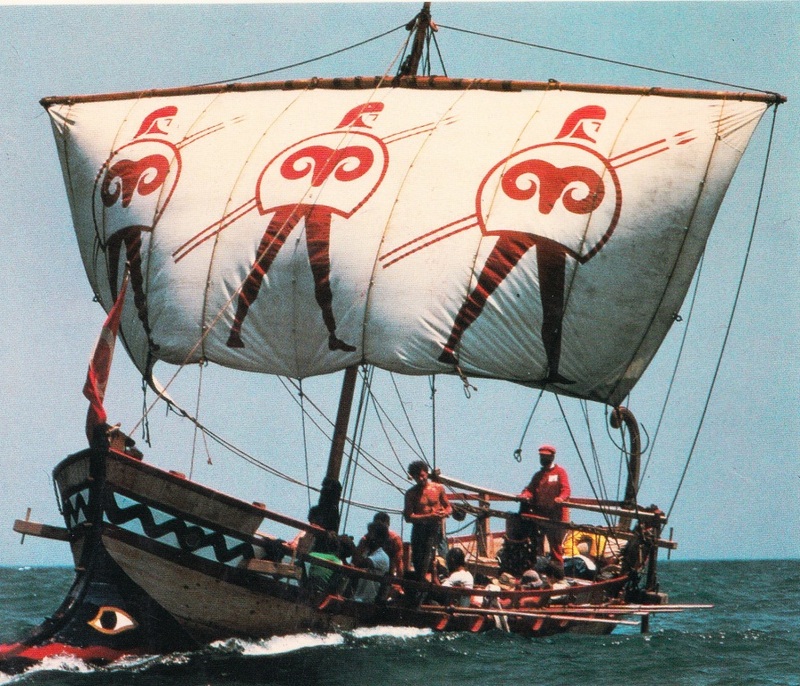 But no Greek ships of that era have ever been recovered, and the only evidence of their form comes from sketchy, stylized illustrations found on pottery of the era. 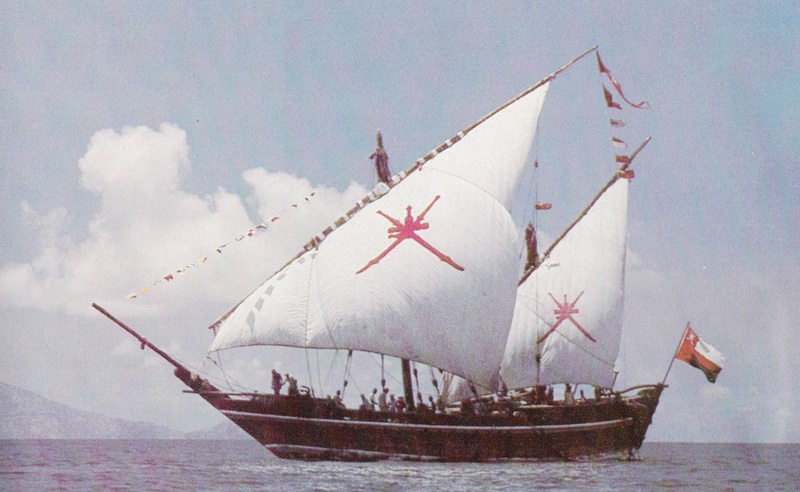 We do have firm archaeological evidence for Greek ships from several hundred years later, however, and that evidence drove the design of the new vessel, which was drawn by British naval architect Colin Mudie, who had designed the curragh for Severin's previous project, The Brendan Voyage (also discussed in a prior post). 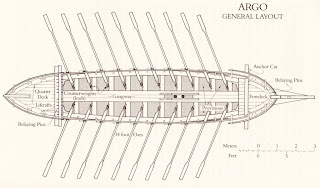 While Jason's Argo had 50 oars, according to the epic poem of Apollonius, Severin's Argo would have but 20, making the vessel considerably smaller and more economical to construct and campaign. Severin felt that if a 20-oar vessel could complete the voyage of reenactment, that would more than demonstrate the feasibility of the original legendary voyage. 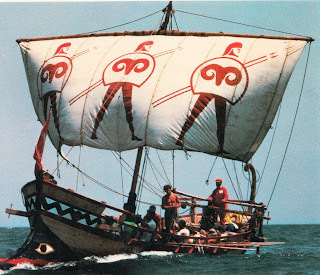 As discussed in a previous post, the form of Greek warships of even Homer's date is debatable, so the form of a ship of Jason's era is even less sure. With this uncertainly permitting flexibility on Mudie's part, he designed the vessel with an eye toward safety, with fairly full lines, high gunwales and even higher ends. 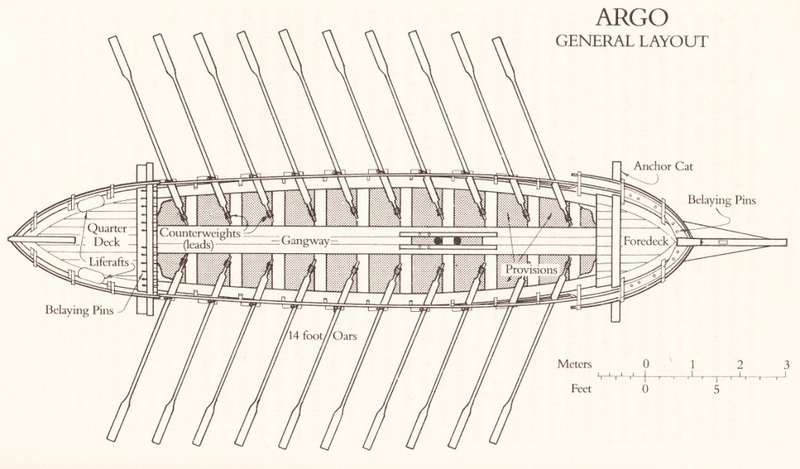 The new Argo was an aphract -- a vessel with all the oars on one level -- 54' LOA, 9' in beam, and 3' of draught. As shown above, the hull is lovely in profile, and only moderately slender in plan view. All this is a kind of preface to asking: just how close did Mudie come to an accurate reproduction? Argo struggles against the current in the Bosphorus -- the most difficult rowing of the voyage. Severin holds the construction model of Argo. Note how the extended bow appears to be added on to a bow of more conventional form. Looking at the profile drawing, the ram-shaped bow appears to be added-on to a conventional bow. 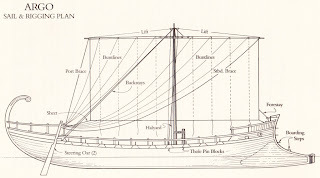 From the upward run of the planks near the keel just abaft of the hawsehole, it looks as if the bow has a conventional run below the waterline, and that the extended bow was created by overlaying "cheeks" of partial strakes between the extended stem and the hull's main strakes where they begin to curve inward at the bow. I suspect that a real, conventional, aft-curving stem lies hidden beneath the triangular cheeks, and that the forward-curving stem is a false stem that ties into an extended keel. This appears to be confirmed by the construction model held by Severin in the photo above. (Severin's shipwright followed this model and did not work from plans.) One wonders if the area inside the cheeks, between the two stems, was filled with buoyant material or left hollow as a watertight buoyancy chamber. Either way would appear to be a breeding ground for rot. I have never seen any depiction or description of ancient Greek ships that suggests this approach, and I don't know of any reason to believe it correct. The more logical approach by far is for the hull's strakes to run directly to the visible stem, with no hidden stem and no cheeks filling out the hollow waterlines. I can only guess that Mudie and Severin thought they'd have better luck finding a Greek shipwright who could build a conventional bow and then add a false front to it, than one willing to experiment with an unfamiliar reverse-curving stem and the attendant unknowns about how to plank up to it. Argo under sail. A single helmsman manned the two tillers, moving them in opposite directions to steer. With a shallow keel and no other lateral plane, Argo performed poorly under sail, unable to maintain even a broad reach until it was discovered that by moving virtually all stores and crew onto the after deck, pointing ability improved by 15 degrees. And this was without the heavy bronze fitting that would have tipped the ram on a real warship. Argo was also difficult to turn, the extended bow tending to keep the boat heading in its current direction regardless of the position of the dual side-rudders. (By the way, both rudders broke twice during the voyage, although this may have been a failure of execution, not design.) It's interesting that Viking ships managed with a single side-rudder although, without the extended bow, they were probably easier to steer in the first place. 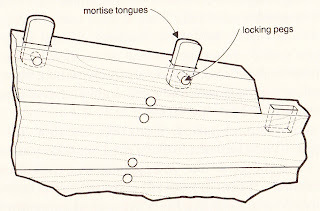 Planks were joined edge-to-edge with free tenons ("mortise tongues") in matching mortises in the facing plank edges. All was held in place with wood plugs through the planks and the tenons. 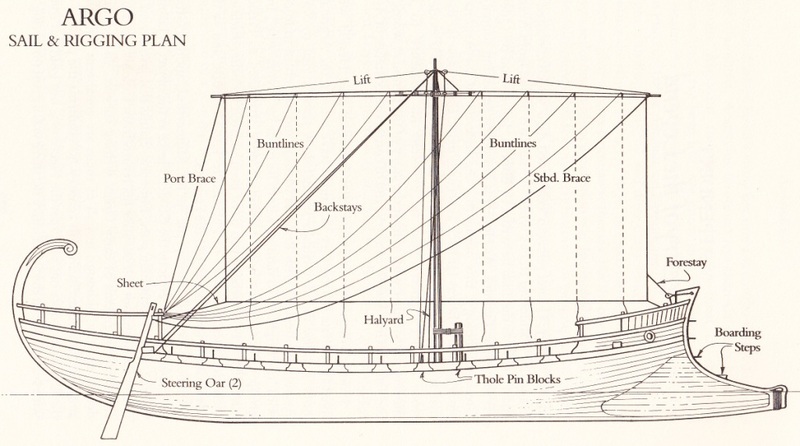 As in Homer's vessels, the hull was built shell-first, with frames added only after the planking was complete. 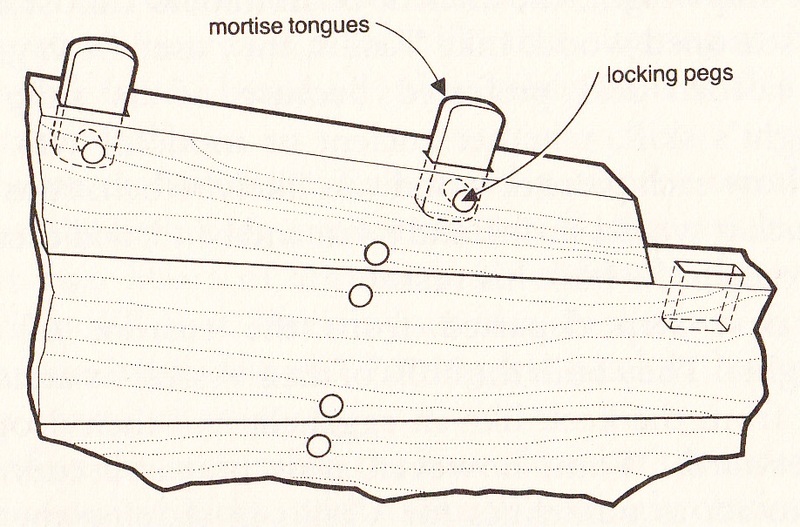 Plank-to-plank fastening was done with the mortise-and-tenon method, as illustrated above and discussed in a previous post. Although it is an effective fastening method, the high intensity of labor that it requires is well recognized. Severin disagrees, however, claiming that it was quite efficient. But one gets the sense that he says this as a tribute to his shipwright's skill, for he also acknowledges that, where the shipwright handled every other aspect of construction single-handedly, using only hand tools, the free tenons were cut by a helper, who also did the mortising with the help of a machine. 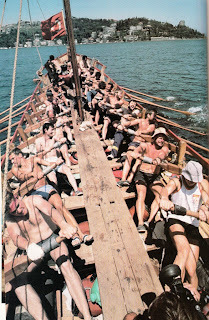 The "Jason voyage" was successful in its objective of traveling from Greece, across the Aegean Sea, through the Dardanelles, the Sea of Marmara, and the Bosphorus, and along the entire southern coast of the Black Sea, to Poti, Georgia -- a distance of some 1,500 miles. (And Severin later used it to recreate the tale of the Odyssey in The Ulysses Voyage: Sea Search for the Odyssey .) But partly because the questionable accuracy of the boat in which the voyage was accomplished, the validity of any conclusions that may be drawn from the voyage are questionable as well. This is not to imply that the new Argo was poorly designed or in any way deficient. We simply don't know enough about the ships of Jason's era or their performance, and Severin's experiment provides a useful benchmark against which future research can be compared. And all technical issues aside, the book is still a fine adventure, stirringly and sensitively told. In an unusual "exhibit" that makes conservation work visible to the general public, the Peabody Museum of Anthropology and Ethnology at Harvard University is conserving an important Alutiiq kayak in a public viewing area. The Alutiiq people, also known as the Pacific Yupik, live in coastal southern Alaska. 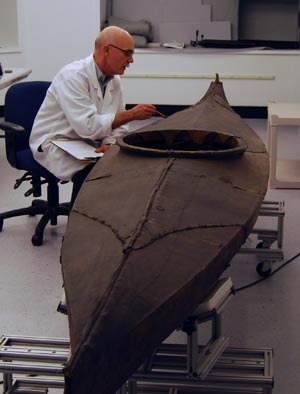 According to the museum's website, the kayak is the only known Alutiiq warrior kayak in America. The kayak has a bifurcated bow characteristic of the Alutiiq. Based on clues from oral history, its human hair detailing and possible construction of bear skin led to its identification as a warrior's craft. The conservation is being done in a specially prepared gallery space where visitors can observe and discuss the work with the conservators. The museum has many other important Alutiiq artifacts, some of which are also undergoing conservation. And the project maintains a Facebook page with frequent updates on its status. Of course the title of this post is meant as a malapropism, but John Lindman of the Bark Canoe Store comes as close as anyone to making an "authentic" birchbark canoe out of fiberglass. Lindman is well-known as a skilled builder of real birchbark canoes, of which he's built a variety of styles. But as anyone who has ever looked into owning a real birchbark canoe quickly finds, the craft are expensive. Lindman's least expensive grade runs $345 per linear foot, and I know of at least one bark canoe builder who charges $1,000 per foot. Furthermore, they're not the easiest boats to maintain, and they don't fare well in dry climates like the U.S. Southwest. Because of these drawbacks, there is a small but apparently worthwhile market for canoes that look like birchbarks but are made from modern composites. (We're not talking here about the products of some canoe makers who take a standard canoe hull and just paint the outside to look vaguely like birchbark. These are generally laughable, since they invariably show the wrong side of the "bark" facing out.) This would include at least three sub-groups: i) folks who simply want something that looks credibly like an authentic, old-time artifact but either can't afford one or can't be troubled with the practical liabilities of owning the real thing; ii) historical reenactors; and iii) producers of movies, historic documentaries, and public events. Lindman serves these markets with a range of fiberglass replicas in three grades. The bottom of the line is built like a conventional fiberglass canoe, with lines that replicate Algonquin and Ojibwa types. 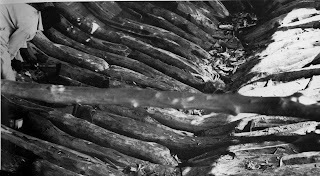 Gunwales are real wood, lashed with plastic imitation split root. Next up is an infusion-molded version of the same designs, with internal ribs. In infusion molding, the fiberglass or other fabric is laid up dry on the mold. It is then covered with a plastic sheet which is hooked up to a vacuum pump. As the pump draws air out from beneath the sheet, liquid resin -- in Lindman's case, vinylester resin -- is drawn in by the vacuum. The result is consistent wet-out of the fabric without any excess resin to add weight. Lindman's website says the ribs are made of "core material," but since various materials may be used as cores in composite boatbuilding, this is ambiguous. Both the economy and the infusion-molded canoes are available fully assembled or as kits with the hulls complete and components that must be finished and assembled by the customer. The third and most costly of the fiberglass replica canoes is a hybrid, using a fiberglass outer hull and cedar sheathing and ribs, and real split-root lashings, as in a real birchbark canoe. All three versions are properly painted to represent the dark brown inside surface of the bark facing out, with seams between bark panels and at gores sealed with pitch. They really do look quite authentic -- good enough for use in movies and reenactments -- and I suspect they consistently fool folks who have never seen a real birchbark canoe. 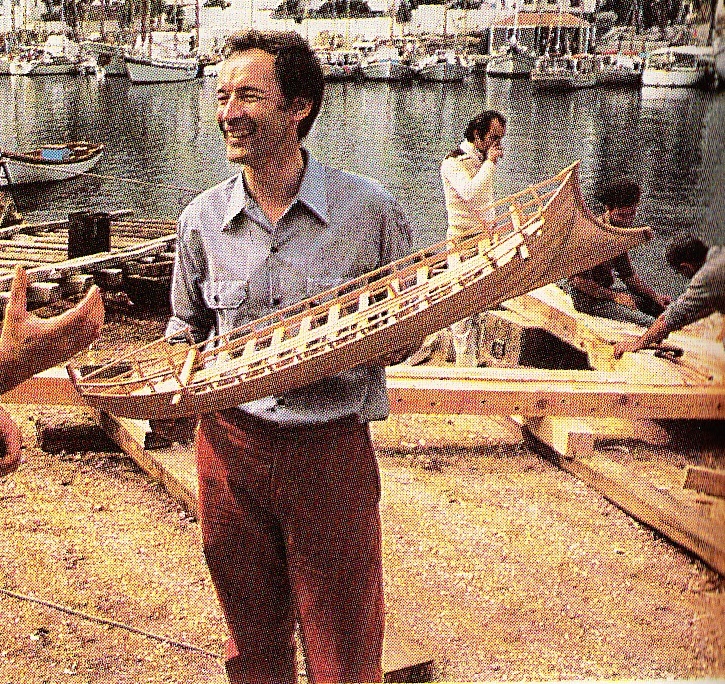 Lindman publishes an occasional e-newsletter with news about bark canoes and his shop's doings. Subscribe here.